RTL 2009 Float: "Too Many Children?" 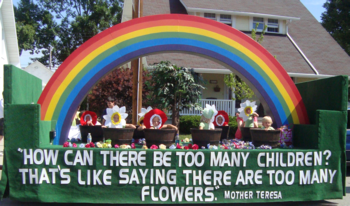 Right to Life's 2009 parade float feature d Mother Teresa's saying: "How can there be too many children? That's like saying there are too many flowers." Thank you to Sara Stueve for managing the float. Thanks also to the many drivers, riders, and decorators who assisted at the various parades: Jackson Center, Versailles, Botkins, Anna, Ft. Loramie, and Sidney Applefest. It again took third place in the Botkins Carousel parade.